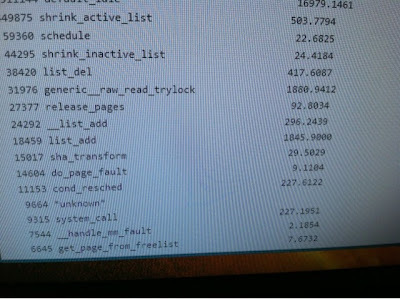 One of my systems was showing high system CPU utilization. While trying to diagnose this high system cpu usage, I discovered the profiler built into the kernel. To enable Linux kernel profiling, you must set the profile parameter on the command line . Boot the kernel with command line option profile=2 (or some other number instead of 2). 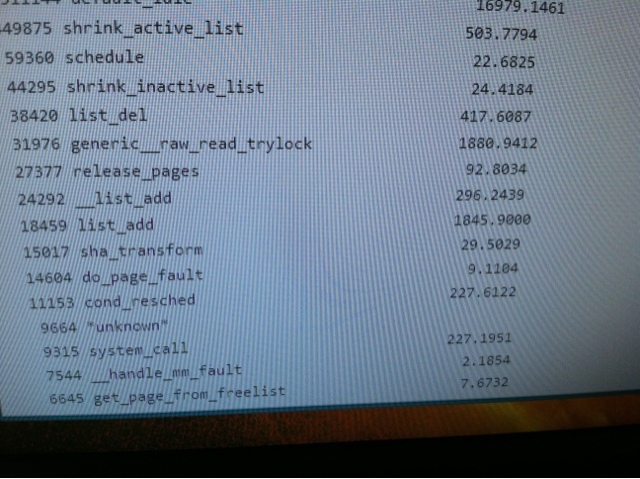 This will cause a file /proc/profile to be created. The number given after profile= is the number of positions EIP is shifted right when profiling. So a large number gives a coarse profile. The counters are reset by writing to /proc/profile. The utility readprofile will output statistics for you. It does not sort - you have to invoke sort explicitly. Here is my sorting command and some of the output, in case you were interested. This allows me to look up each of these functions in the kernel source and make guesses as to why the system is spending so much time performing those tasks.